In a week that sent us reeling, words fall short. To put it mildly, we echo Rev. Nancy Taylor in saying that it was “the strangest.” It will be a long time, if ever, before we can construct a narrative that makes any kind of sense out of the violence and chaos of last week. But there were some scenes, some moments so poignant that we hope that when we look back at these days, these moments of hope are woven into the stories we tell. Monday, April 15, 2013 – As word gets out about the explosions, waves and waves of people took to the internet to check in on each other. Even though cell lines were clogged or disabled, members of The Sanctuary community reached out to one another and spread the word of each other’s safety. 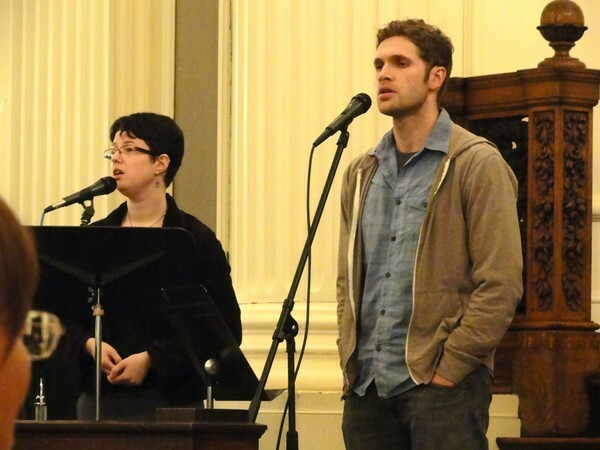 Tuesday, April 16 – 10:00 AM – Members of the Sanctuary’s music team met to rehearse for Thursday’s service. We had planned to meet at Arlington Street Church, just three blocks from the Marathon’s finish line. Before the rehearsal, the musicians looked out onto Boylston Street from the church’s roof. It was desolate, with space blankets and gatorade cups still strewn everywhere. Through song, through sharing, through being together, our tender hearts began to thaw from the shock. We began to envision what healing might look like. Tuesday, April 16 – 8:00 PM – Members of The Sanctuary Boston joined congregations from around the Back Bay for an interfaith candlelight vigil back at Arlington Street Church. More than 700 people attended, and we joined in song, in prayer, and in silence. You can read more from the New Yorker, listen to audio of Dave, Jo, and Mark leading the “Meditation on Breathing”, and view some great pictures from the Charlestown Patch. Our message: Love is bigger than fear. Thursday, April 18 – At our Sanctuary worship, Teo Drake spoke about how spiritual practice can give us enough grounding and nourishment that we can allow our hearts to be broken and to be broken open. We sang, we prayed, we … didn’t want the service to end. Worship despite “shelter in place”; we took shelter in each other. Including Sanctuary folks Schuyler, Sarah, Seth, Sean, and Jo. Friday, April 19 – Lockdown. Isolated in our homes in Watertown, Boston, Cambridge, Somerville, Brookline, Newton. Glued to the news and the social media. Helicopters. Sirens. And yet, “There is a crack in everything. That’s how the light gets in.” Again and again this week, community broke through the ice of fear. 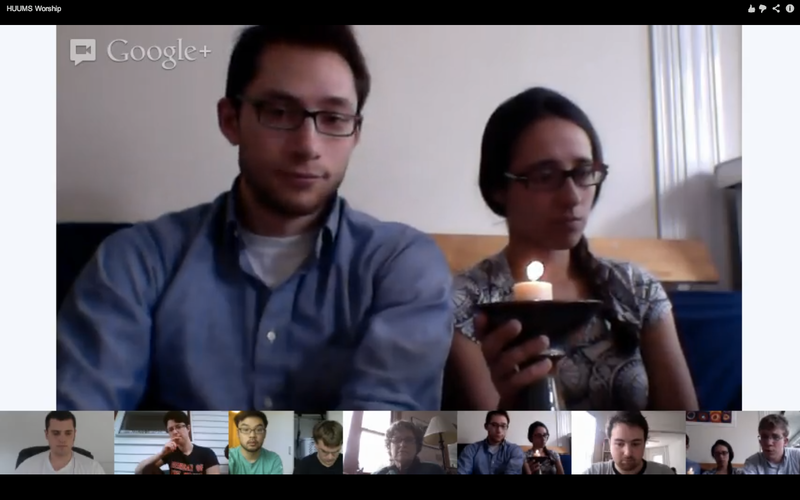 The Harvard Unitarian Universalist Ministry for Students (HUUMS) held their noon worship online, giving us a place to be together despite a “shelter in place” order that kept us closed in wherever we were. Sunday, April 21 – The Sanctuary Boston joined in with other Back Bay congregations in an interfaith service at the barricade at Berkeley and Boylston Streets. Torah scrolls mixed with gold crosses mixed with comfort dogs mixed with singing mixed with people giving out free hugs.